Monroe, Wisc. (April 16, 2018) – Congratulations to Kiwanis Club of Monroe Foundation, a winner of Old National’s Choose Your Charity Giveaway. 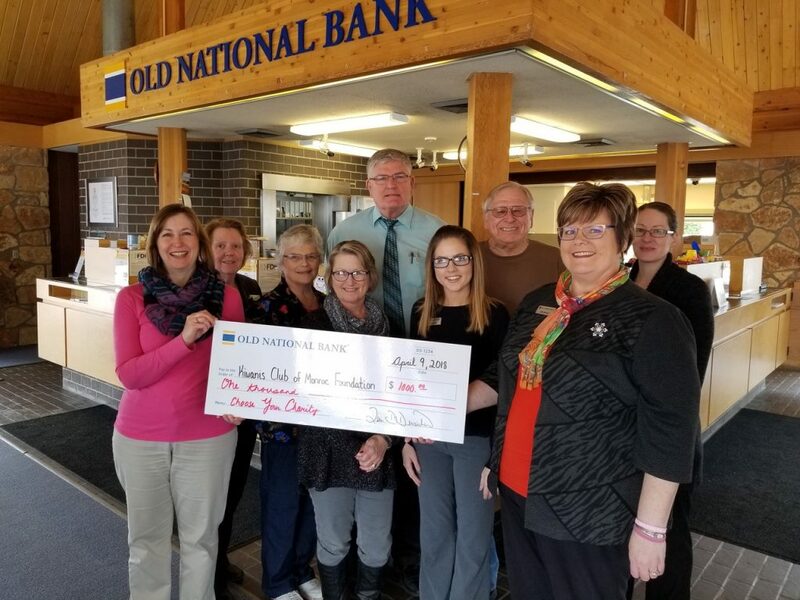 Thanks to the community voting, 39 Wisconsin-based charitable organizations will each receive $1,000 from Old National Bank. Over a four-week period, individuals could vote online or in a Wisconsin Old National Bank branch for their favorite charity. The non-profit with the most votes at each Wisconsin banking center is receiving $1,000 as the winner of the Choose Your Charity Giveaway. A full listing of the 39 winning non-profit organizations can be found at oldnational.com. Old National Bancorp (NASDAQ: ONB), the holding company of Old National Bank, is the largest financial services holding company headquartered in Indiana. With $17.5 billion in assets, it ranks among the top 100 banking companies in the U.S. and has been recognized as a World’s Most Ethical Company by the Ethisphere Institute for seven consecutive years. Since its founding in Evansville in 1834, Old National Bank has focused on community banking by building long-term, highly valued partnerships with clients. Today, Old National’s footprint includes Indiana, Kentucky, Michigan, Wisconsin and Minnesota. In addition to providing extensive services in retail and commercial banking, Old National offers comprehensive wealth management, investments and brokerage services. For more information and financial data, please visit Investor Relations at oldnational.com.